"When our leaders have become misleaders and mentors have become tormentors. When freedom of expression becomes the target of oppression, opposition becomes our position." The lyrics are from a song titled Situka, which means "Rise up" in Luganda, sung by Ugandan musician-turned-politician Bobi Wine ahead of the 2016 general elections. The Afrobeats artist was using the song to exhort Ugandans to play an active role in fighting corruption and injustice in their country. At the time many of the country's famous musicians backed President Yoweri Museveni's re-election but Bobi Wine however refused to hop on the bandwagon. It was then that some suspected that he wanted to play an active role in politics - a change of career which has now led to him being charged with treason and allegedly tortured by the military, which the authorities deny. The Afrobeats star, who began his music career in the early 2000s, has always described his craft as "edutainment" - entertainment that educates. One of his earliest hits, Kadingo, is a song about personal hygiene. Bobi Wine, whose official name is Robert Kyagulanyi Ssentamu, was elected to parliament as an independent in a by-election last year in Kyadondo East, central Uganda. The 36-year-old beat candidates from the ruling National Resistance Movement (NRM) and the main opposition Forum for Democratic Change (FDC). The self-declared "ghetto president" told the BBC after his win that he represented a new generation: "I am going to stand up for issues. I'm here to give young people confidence," he said. The moniker came about after he continued recording music, despite his fame, in his poor neighbourhood in Kamwokya, in central Kampala where he grew up, the BBC's Patience Atuhaire says. In July, Bobi Wine locked arms with activists and marched on the streets of the capital, Kampala, to protest against a social media tax introduced ostensibly to boost state revenue and to end what Mr Museveni called "gossip" on WhatsApp, Facebook and Twitter. Critics, however, said the 200 Uganda shillings [$0.05, £0.04] daily tax was meant to suppress dissenting voices. Bobi Wine was also a leading critic of the NRM's push to scrap the constitutional upper age limit, set at 75, for presidential candidates. He was among several opposition lawmakers who frustrated numerous debates in parliament to resist the change. 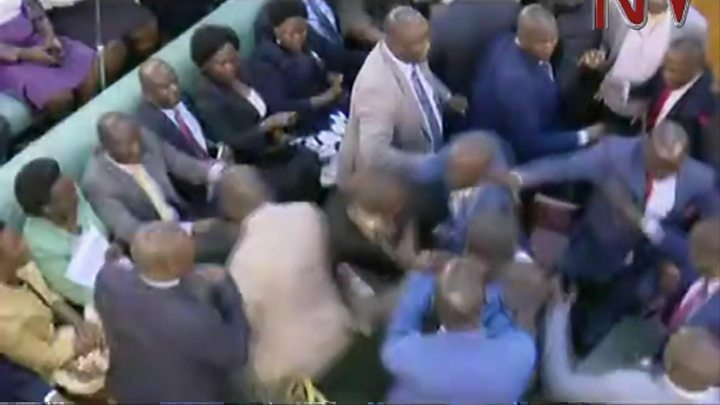 The opposition was however overwhelmed by lawmakers from the ruling party who managed to pass the bill that will allow Mr Museveni, 74, to run for a sixth term in 2021. He has been in power since 1986. "He lost touch with the people [and] the values that he stood for. 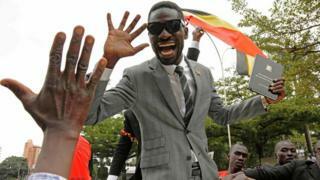 He came preaching fundamental change but right now he stands for no change," Bobi Wine told the BBC. Political analyst Nicholas Sengoba says the 14 August by-election in the north-western town of Arua, which was won by a candidate backed by Bobi Wine, was "do or die for Museveni". It was during the campaign for this by-election that he was arrested and then allegedly assaulted. He, and more than 30 others, were accused of throwing stones at the presidential convoy, accusations they deny. "Bobi Wine has now beaten Museveni and Besigye four times," in local elections, says Mr Sengoba. "His party would be wondering if this is now a trend. "Bobi has rallied his support to the slogan 'people power', and he aims to galvanise and organise it into a movement," he adds. Political analyst Robert Kirunda says Bobi Wine's appeal comes from a "leadership vacuum" in Uganda. "There are many young people who are not interested in the historical struggle that brought NRM to power, nor with the radical defiance of the main opposition, [Kizza Besigye's FDC]. Most of them want jobs and they feel the economy is not working for them." According to arts journalist and blogger Moses Serugo, Bobi Wine's oratory skills and his alignment to people who live in the "ghetto", mostly the youth, have allowed him to appeal to them. He says Bobi Wine's career as an actor, not a singer, is what has helped him become such an influential politician. Mr Kirunda says Bobi Wine's recent legal troubles and the alleged assault have actually raised his profile. "The nature of his experience and the severity of his treatment has changed Uganda's political trajectory forever." "No politician has upset the political scene and got Museveni reacting they way he has," he adds. Public pressure and protests have pushed President Museveni to deny that Bobi Wine was brutally beaten. He dismissed the reports as "fake news". "No Ugandan has gathered so much international attention like Bobi Wine has. He was everywhere, New York Times, Washington Post, BBC," Mr Kirunda says. Mr Kirunda adds that Bobi Wine has also upended opposition politics. Just like long-time opposition leader, Kizza Besigye, Bobi Wine had now experienced what Mr Kirunda calls "the power of the state machinery". "The Bobi Wine who was arrested and detained is not the same one that was released." He says that the politician has now undergone "his baptism". Mr Kirunda says that the challenge for the pop star politician now is how he deals with the expectations of his mostly young supporters. "The weight has now fallen on his shoulder, his supporters will be watching".